Successfully saved Vegan Almond Butter Chocolate Chunk Blondies to your Calendar. You can also save the ingredients to your Grocery List. 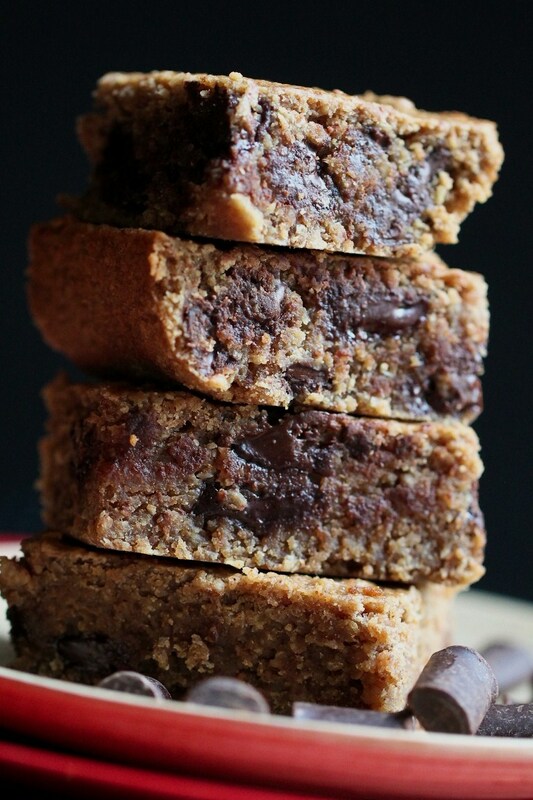 These Vegan Almond Butter Chocolate Chunk Blondies are incredible! Vegan, gluten-free and oil-free and just 8 ingredients! Just mix everything into a bowl and bake! Made with oat flour and almond butter! If you grind your own oat flour, it is best to use quick cooking oats, as this will make them as smooth as storebought flour, otherwise the flour won't be as smooth, therefore the bars as smooth. Also, make sure to processor them for a good couple of minutes to get the flour really fine. This recipe only uses 8 ingredients, so each one is crucial to the result. I often provide other subs that I have tested, but for these I don't recommend any subs, or it could totally alter the result. I have found the combo of oats and tapioca to work best here, so use those for best results. 1 3/4 cup oat flour (205 g) (Use certified gluten-free oat flour if necessary, I use Bob's Red Mill) 1/4 cup tapioca starch/flour (30 g) 1/2 teaspoon fine sea salt 1/2 cup (180 g) pure maple syrup 1/4 cup + 2 tablespoons (80 g) PACKED light brown sugar (other sugars will yield different results, so it's not recommended!) 1/2 cup (138 g) unsweetened applesauce 1/2 cup (130 g) creamy roasted almond butter (warmed to smooth consistency prior to measuring, use sunbutter for nut-free) 1 1/2 tablespoons vanilla extract 1/2 heaping cup semi-sweet chocolate chunks, OR use 3/4 cup chocolate chips, you'll need more since they are smaller, plus extra to put on top (120 g) If you grind your own oat flour, it is best to use quick cooking oats, as this will make them as smooth as storebought flour, otherwise the flour won't be as smooth, therefore the bars as smooth. Also, make sure to processor them for a good couple of minutes to get the flour really fine. This recipe only uses 8 ingredients, so each one is crucial to the result. I often provide other subs that I have tested, but for these I don't recommend any subs, or it could totally alter the result. I have found the combo of oats and tapioca to work best here, so use those for best results.